Be the first to share your favorite memory, photo or story of Alan . This memorial page is dedicated for family, friends and future generations to celebrate the life of their loved one. Alan Rose, age 62, passed away Monday November 12, 2018 at his residence. Mr. Rose was born March 2, 1956 in Madison County, Ky., to the late Orville Rose and Elsie Hurt Rose Alexander. Alan was a retired plumber with Berea College. 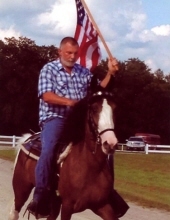 He loved his work, riding horses, and was a great provider for his family. Alan was of the baptist faith. Other than his parents Alan was preceded in death by a sister, Phyllis Jean Rose, and a grandchild Baby Sell. He is survived by his wife Loraine Bowman Rose, two sons, David Alan Rose Coffey and his wife Marcia of Mt. Vernon, Christopher Alan Rose of Richmond, three daughters, Heather Nicole Rose of Berea, Jessica Dawn Rose Maupin and her husband Brian of Livingston, Brittany LeeAnn Rose of Berea, two sisters, Teresa Faye Barrett and her husband Donald of Waco, Pamela Joyce Preston and her husband Jimmy of Berea, eight grandchildren, Christian Sell, Dawson Sell, Zachary Coffey, Makayla Coffey, Emily Maupin, Cody Maupin, Kelsey Maupin, and Wesley Maupin. To send flowers or a remembrance gift to the family of Alan Rose, please visit our Tribute Store. "Email Address" would like to share the life celebration of Alan Rose. Click on the "link" to go to share a favorite memory or leave a condolence message for the family.